Increasing energy costs make conservation and efficient use of facilities an important part of today's greenhouse operation New greenhouse designs better glazing improved heating and ventilating equipment and new management systems should be included when upgrading or adding on. With typical annual energy usage being 75% for heating, 15% for electricity and 10% for vehicles, efforts and resources should be put where the greatest savings can he realized. This is a good starting point as infiltration losses can be significant and are easy to fix at low cost. Infiltration losses double at wind speeds of 15 mph. Weatherstrip doors, vents and fan openings. Close gap around stovepipe penetration. Lubricate fan shutters frequently so that they close tight. A partially open louver may allow several air changes per hour. For example, a 48" fan louver that fails to close properly leaving 1" gaps, allows 23,000 Btu/hr of heat to escape costing $0.58 if you are burning $2.50/gallon fuel oil. Shut off some fans during the winter and cover openings with insulation or plastic. Use poly with an infrared inhibitor as the inner layer for 15% savings. Payback is 2-3 months. 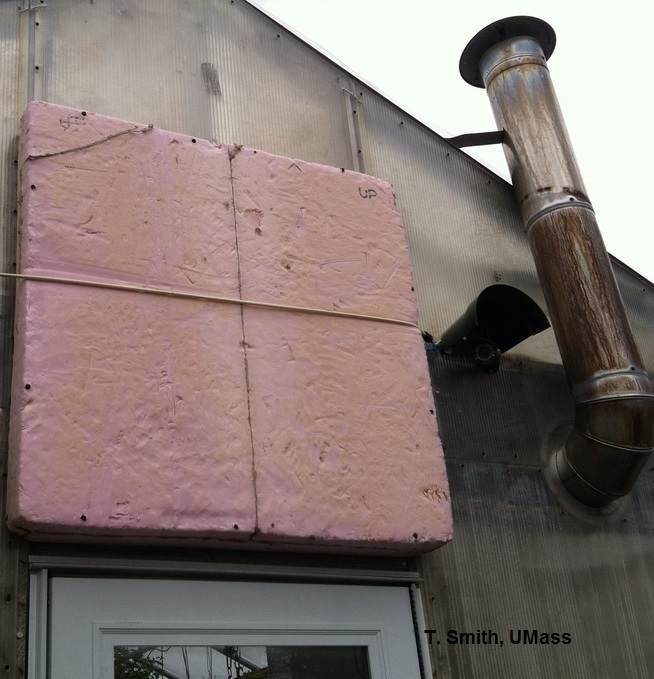 Payback on insulation is usually less than 2 years. Insulate the perimeter below ground - Installing 1"- 2" thick insulation board to 2' below ground level will reduce the heat loss from the warm interior soil to the cold ground outside. Insulate the kneewall or sidewall/endwall to bench height - Use 1" to 2" of insulation board. Applying 2" of foam insulation to a 3' high kneewall on a 28' x 100' greenhouse will save about 400 gallons of fuel oil/year. Cost is about $1/sq ft with a payback of less than one heating season. An alternative is to use double bubble insulation with aluminum foil on both sides. The cost is about half as much but the life is also shorter. 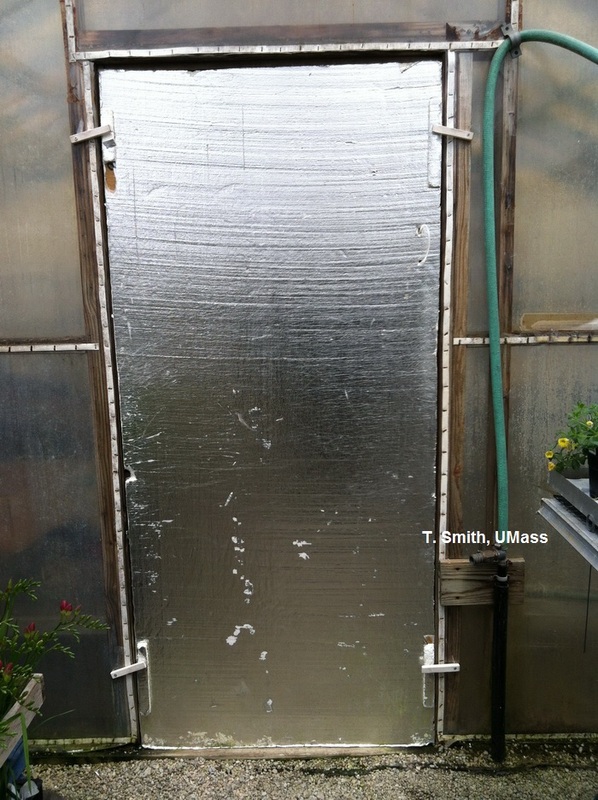 Insulate behind sidewall heat pipes - Use insulation board or aluminum faced building paper to radiated heat back into the greenhouse. Leave an air space next to the wall to prevent frost damage to the wall. Insulate hot water pipes - Adding 1" insulation to heating system supply pipes or domestic hot water pipes will save $2 to $4/linear foot in smaller diameter pipes and more with large diameter pipes. 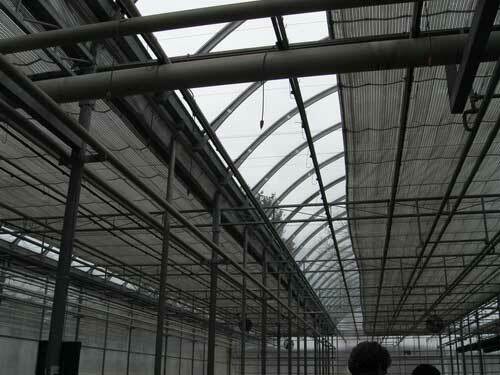 Reduce the air volume heated and lower surface temperature. Install an energy/shade screen overhead for 20%-50% heat savings. Cost is $1.50 -$3.00/sq ft. Payback is 1 -3 years. Add a second screen to save an additional 10 -15%. Screens trap the heat inside and reduce the heat loss surface area. Tight closures should be maintained where curtains meet sidewalls, framing or gutters. Use a closed weave material for maximum savings. Heat and water lines should be insulated or located below the screen. Systems are available for hoophouses that are heated all winter. Add roll-up or drop down sidewall screens for additional savings. These can be either manual or mechanized. Yearly maintenance - Check boiler, burner and backup systems to make sure they are operating at peak efficiency. Have furnaces cleaned and adjusted and an efficiency test run before heating season. A 2% increase in efficiency for a 30' x 150' greenhouse will save about 200 gallons of fuel oil. Installation of root-zone heat will allow air temperature to be set 5° - 10°F lower with a savings of 10-15% in heat cost. Heat source can be a boiler or hot water heater. Provide about 25 Btu/sq ft of growing area with a water temperature of 90-110°F. Use PEX tubing spaced 9 - 12" apart for in-floor installation. Low—output fin under the bench or EPDM tubing on the bench provide uniform temperature. Control is with a remote bulb sensor thermostat. Install high-efficiency heaters or boilers — Condensing heaters and low mass, condensing boilers can provide 90%f efficiency with natural gas or propane fuel. Extra heat is removed reducing the flue gas temperature to less than 200°F, PVC pipe can be used as the flue. Insulated water tank heat storage- This system works well with wood or coal fired boilers and solar systems. Hot water stored during the day is used to heat the greenhouse at night. A smaller boiler can be installed. Typical storage capacity is one gallon per 200-300 Btu/hr of boiler heat capacity. Tank capacities to 500,000 gallons are available. Biomass boilers - On a million Btu basis, wood cost is ¼ to ½ the cost of fossil fuel. New technology and design have improved the efficiency of wood boilers. Wood gasification smoke control, automatic chip or pellet feed, electronic combustion control and safety controls have helped to meet EPA standards. Available in sizes from 200,000 - 10,000,000 Btu/hr. Shell corn - Locally grown corn can he economical if cleaned and dried to less than 15% moisture content. One bushel has the heat equivalent of 2.9 gallons of fuel oil or 4.4 gallons of propane. Average crop yield is 120 - 160 bu/ac. Automatic feed and ash removal are part of most larger corn fired heaters. Used motor or cooking oil - Quantities of these may be available locally at less than half the cost of fossil fuel. Time for collection, filtering and handling needs to be added. Sludge disposal can add to cost. Solar - With state and federal grants, the new improved photovoltaic systems can have a reasonable payback and help to offset the cost of electricity. A good site with solar access is required. A tie to the utility grid will help to even out the load and offset some of the purchased power. Electronic controls provide greater accuracy and less override. Install electronic controllers with a +/-1°F accuracy. Potential yearly savings of 500 gallons of fuel oil in a 30' x 100' greenhouse when changing from a mechanical to an electronic control. Controllers also integrate the heating and cooling systems, provide clay/night and DIF settings, record environmental data and provides an alarm system. Additional controllers for misting, irrigation, lighting and carbon dioxide control are available. Check accuracy of thermostats and sensors - correcting a reading that is 2°F high will save $100-$200 per year. Aspirate thermostats or sensors for more uniform temperature control. Differential between on and off can be reduced as much as 6°F. Install horizontal air flow (HAF) fans to get more uniform temperature in the growing area. Use 1/15th horsepower, 12" to 20" diameter fans spaced 40' to 50' apart suspended overhead to create a horizontal air flow pattern in the greenhouse. Fans should operate continuously except when the exhaust ventilation system is on. HAF also reduces disease pressure by drying the leaf surfaces and increases carbon dioxide level next to the leaves.